Blowout Sale! 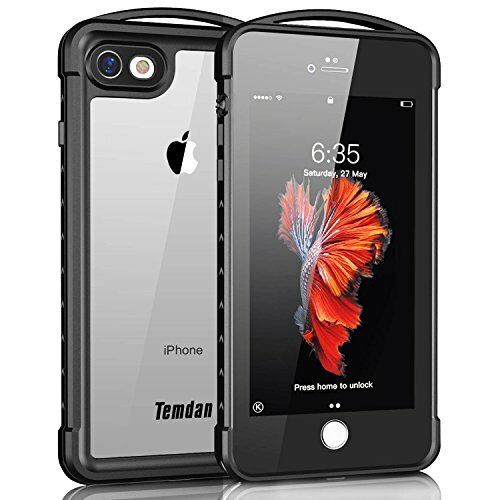 Save 59% on the iPhone 7/8 Waterproof Case, Temdan Supreme Series Waterproof Case with Carabiner Built in Screen Protector Outdoor Rugged Shockproof Clear Case for iPhone 7 and iPhone 8 (4.7 inch) by Temdan at Got Busted Mobile. MPN: TDCASE0060. Hurry! Limited time offer. Offer valid only while supplies last. View More In Waterproof Cases. 【Private Design & Outdoor Apply】: Temdan private design differentiate this from other similiar cases. Compatible with both iPhone 7 and iPhone 8 (4.7inch) ONLY.Special designed for underwater activities, outdoor sports and daily use. 【Extremely Shockproof】：Passed test falling from 6.6ft/2m height,surpassed the MIL STD 810F-516 standard.Safeguard your iPhone. 【Multi-Function】：The front cover comes with high touch sensitivity built-in screen protector. Good sounds quality, shows the original sounds when calling, listening to music and watching videos. With useful accessories (a Metal Hook, a Floating Strap). 【Warranty & Guarantee】：12-Month Warranty and 100% money back or replacement. Proper installation is extremely important to successful use, please review the user manual to ensure correct installation to make the case fully sealed. Email us first if there's any problems. If you have any questions about this product by Temdan, contact us by completing and submitting the form below. If you are looking for a specif part number, please include it with your message. HolaFoto MEIKON Hight Quality 40m 130ft Rated Dive Professional Submersible Underwater Photo Video Camera Waterproof Photo Housing Diving Swimming Skin Protective Case Cover for Apple iPhone 6 4.7"